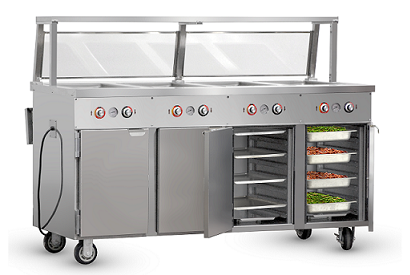 A mobile cart is an asset to the commercial kitchen, able to be wheeled out when you need it, and rolled to the side when you don't. 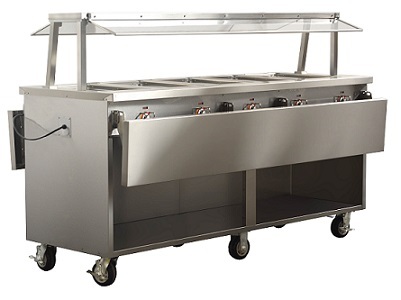 Mobile serving stations are perfect for cafeterias, buffets, schools, prisons or buffet style applications in restaurants, institutions, or other demanding environments. FWE's HLC-W-DRN series provides both heated top serving wells as well as heated lower compartments to keep refills close at hand. Each well and heated holding compartment is controlled separately for added versatility. Handy line serving wells are designed to provide flexibility to foodservice operations and meet capacity requirements, that's why units are available from a single well unit up to a serving line of six wells. Top mount serving wells are one piece stainless steel with a ridge around the top perimeter on which pans are mounted. Wells accommodate 12" x 20" and GN 1/1 pans of varying depths. Top wells are designed to be used wet and are able to run smoothly with as little as 1 inch of hot water in the water basin. Simply load the well with hot water, chose the dial setting to heat water basin and create steam, then position your pan of hot food on the lip of the basin. Food should be stirred occasionally so that the temperature redistributes in the pan. These units take advantage of the fact that heat is transferred much more efficiently through steam than either heated water or air. By allowing a gap between the water in the basin and the pan, steam is created. Water levels should be monitored as water evaporates over the course of service to maintain steam. Each heated well connects to built-in manifold drain system equipped with an easy access external shut-off valve. These built-in drains make it easy to remove water at the end of service and make for simple cleaning. Lower heated compartments use FWE's natural convention heat system, which emits a soft, radiant, uniform heat that gently circulates throughout the cabinet providing a better appearance, taste and longer holding times. Heat rises naturally and circulates from bottom to top without blowers. Radiant heat is best suited for short term heated holing. The lower heated holding compartments are built to accommodate both shallow and deep pans. Units are equipped with unique pan slide racks. The front edges are relived for easy loading, no tip, one piece die stamped stainless steel for extra strength. Racks lift off from heavy-duty stainless steel support and are removable, without tools, for easy cleaning. Controls for both the heated wells and heated holding compartments below are up-front, easy to read and set, and recessed. The lower heated holding compartments are controlled with a full range thermostat that is adjustable to actual temperature and have an operational range thermometer to show the actual internal temperature of the cabinet. Heated wells are controlled with a dial that ranges from 'low heat' to 'high heat.' Separate indicator lights show heating element is 'on' and in a heat cycle for both the heated wells and compartments. Handy line serving wells are made for mobile applications. Units are fully constructed of stainless steel, with a tubular welded base frame, and designed to absorb vibration and shock during transport. Rugged poly casters and super base frame allow this instant serving line to be operational when and where you need it. FWE's solid stainless steel construction is built to withstand continuous, demanding use and will outperform other brands. Units are fully insulated throughout and each well is individually thermo wrapped to provide energy efficient heating and promotes longer holding times. Handy line serving wells are also available with an open base. These open base units offer maximum flexibility for serving applications, allowing ample room for storage and transport to make your food service complete. Open base models are available from double well units up to a service line of six wells. Like models with heated holding compartments, each heated well is individually controlled with up-front, easy to read and set controls. Customize with versatile service line optional accessories and turn your work station into a catering and serving station. Popular optional accessories include built-in cutting boards, tray slide shelves, and sneeze guards. Depending on the location of your operation, sneeze guards may be required by health codes to protect food from germs, dust and other contaminants. Single or double sided sneeze guards are available. FWE offers a variety of optional accessories for our handy line serving wells, to learn specifics, see literature, additional photos and get a quote, visit www.fwe.com/products/heated-holding. If you are interested in speaking to a sales representative about this product other that FWE offers, please contact sales@fwe.com.